Lara Croft, vandalizing archaeological sites since 1996. 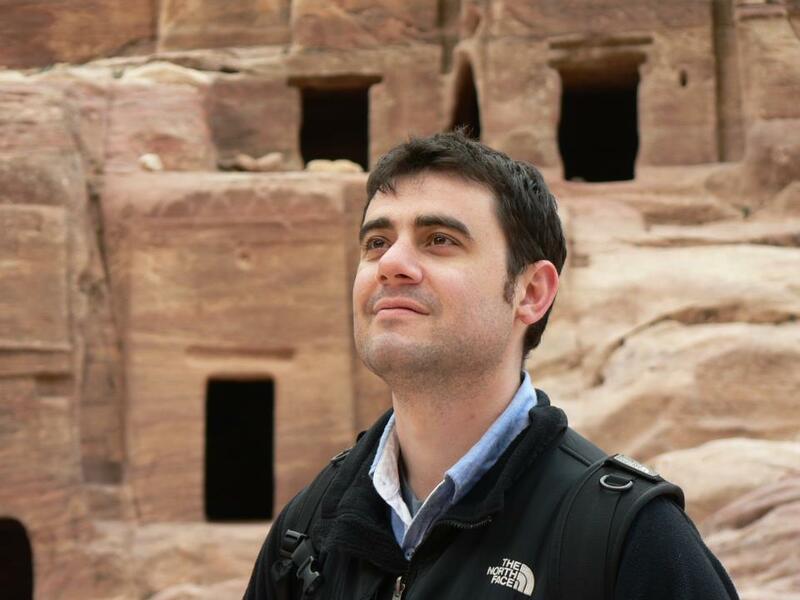 In his Samantha Sutton novels, author Jordan Jacobs went to great lengths to not only introduce his readers to the theories and practice of scientific archaeology but also contrast real archaeology with that seen in films and video games. 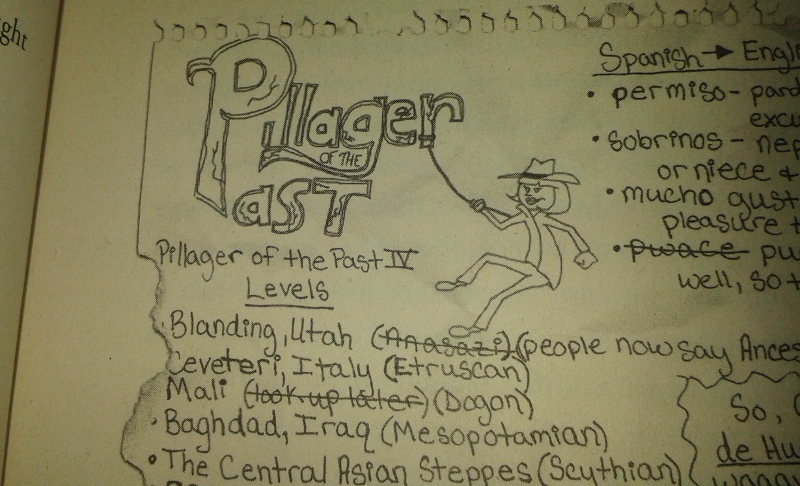 Enter “Pillager of the Past”, the fictional video game series which makes several appearances throughout the first two Samantha Sutton novels and stars a wily female treasure hunter bearing an uncanny resemblance to both Indiana Jones and a certain Ms Croft. And, yes, the similarities are entirely intentional. The Pillager of the Past first appears early in the first novel, Labyrinth of Lies, and happens to be Samantha’s brother Evan’s favourite video game series. The object of the games, we’re told, is to dig up and sell ancient artefacts with the goal of making as much money on the black market as possible. Each game highlights a variety of different locations and ancient civilizations, ranging from the Neolithic ruins of Stonehenge in England to the Scythian settlements of the Central Asian steppes, and features a number of mythical or historic bosses, such as Ötzi the Iceman (who throws exploding mammoth tusk spears and shoots ice beams from his tattoos) and a Chinese dragon that can be killed by a stab to a weak spot on his tail (reminds me of a certain final boss from Tomb Raider II). An extract from Jordan Jacobs’ Samantha Sutton & the Winter of the Warrior Queen. 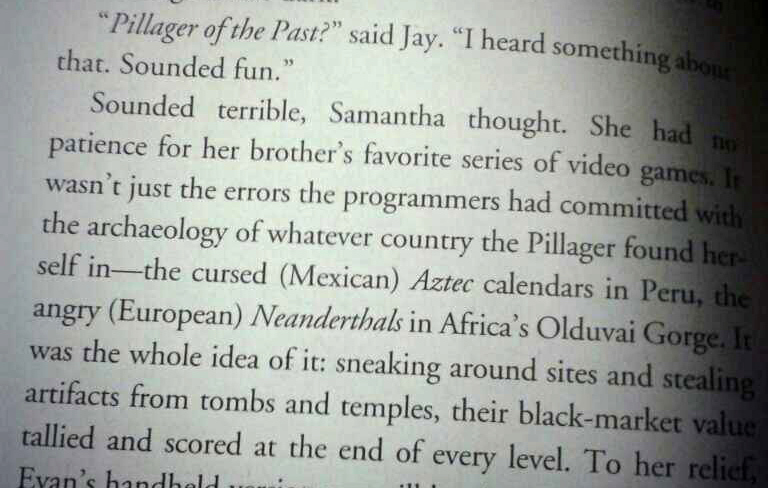 Samantha harbours a strong dislike for the games due to their focus on looting ancient sites and the historical and geographical inaccuracies within them, such as the presence of European Neanderthals in Africa’s Olduvai Gorge and the presence of Aztec calendars in a level based in Peru (just like in Tomb Raider I). So, at one end of the spectrum, you have Samantha who rolls her eyes at any misrepresentation of archaeology in popular culture and at the other end, you have her brother, Evan, who wishes archaeology was more like the variety he’s used to in his video games. In reality, most archaeologists seem to fall somewhere in the middle: condemning the treasure-hunting and looting aspects of Indiana Jones and similar franchises while also being grateful to these franchises for popularizing archaeology. You’d be amazed how many academics cite Dr Jones or Lara Croft as one of the reasons they got into archaeology. Regardless of our personal feelings towards them, these fictional adventurers have become the faces of archaeology and have influenced the way the general public view the profession. In a bid to sensationalize “real” archaeology and appeal to the masses, the media will often refer to professional archaeologists as “the real-life Indiana Jones”. And some archaeologists, perhaps hoping to cash in on that particular connection, have embraced this and have taken to wearing fedoras in front of the camera (disgraced Egyptologist Zahi Hawass being a prime example). 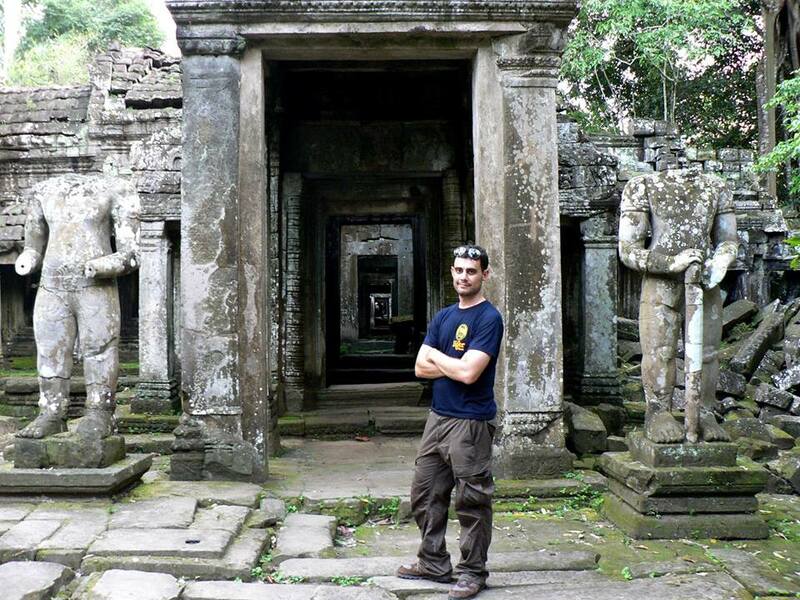 Archaeology has become almost inextricably linked to the exploits of these fictional adventurers and author Jordan Jacobs will be drawing further parallels between his novels and the Tomb Raider games in his upcoming novel, Samantha Sutton and the Temple of Traitors. You can pre-order Samantha Sutton and the Temple of Traitors over on Amazon and Amazon UK. Jordan Jacob’s Pillager of the Past is set to play a major role in his upcoming novel, Samantha Sutton and the Temple of Traitors, so I took it upon myself to ask the author and archaeologist what he thought of the Tomb Raider franchise, how he felt about the depiction of archaeology in popular culture, and whether his Samantha Sutton series could inspire a new generation of young aspiring archaeologists. Kelly M (KM) – The similarities between the Pillager of the Past series in your novels and the Tomb Raider series are pretty unmistakable. Are you a fan of the Tomb Raider games/films? Jordan Jacobs (JJ) – I’m a long-time, unabashed Tomb Raider fan. Of the games, mostly, but I enjoyed the movies, too! During my freshman year in college, I burned through my keyboard on a demo of the then brand-new Tomb Raider 2. Yeah, a DEMO! Just one small piece of the Great Wall level! I knew every nook and cranny pretty quickly, but was too cheap to buy the whole game. It was only when I had my first job that I sprang for Last Revelation and Chronicles. Of these, Last Revelation was – well – a revelation. I eventually got to know every nook and cranny of that one, too. Fast forward to last year, when the reboot served as downtime during a great but exhausting stretch of paternity leave. I loved all the back story, and am excited to see where it gets taken next. KM – I think it’s fair to say that paperback novels, Hollywood, and the gaming industry are largely responsible for depicting archaeologists as little more than treasure hunters and looters. Did you write the Samantha Sutton novels as a way of introducing younger readers to the realities of archaeology as an academic field and career? JJ – That’s definitely been the plan. There’s this horrible mantra you hear when many archaeologists describe their work to the public: “Archaeology is not as exciting as Indiana Jones“. I say “Baloney”. It’s different, but it’s just as big a thrill. Think of the big stories in the last year alone: Richard III, Amphipolis, the LiDAR discoveries in Cambodia. Better than anything in movies or games. And sure, your typical contract, CRM excavation doesn’t involve royals or revolutionary insights into how a mighty empire was structured, but I have yet to experience awe as humbling and intimate as finding the thumbprint of an ancient potter on a tiny potsherd, or finding all the ceramic limbs of a long-ago child’s treasured doll. Samantha’s adventures encompass both sorts of excitement – the thrill of scientific discovery, and the various conflicts, values and very real dangers that surround archaeological work. If it convinces more kids to pursue archaeology as a profession, I’ll be pleased, but I’d be satisfied if it just raises consciousness of what unique experiences and information the science has to offer. KM – I’ve heard that your upcoming novel, Samantha Sutton and the Temple of Traitors, will be set in Cambodia and will tackle the issue of how archaeology and archaeologists are depicted in video games and movies. Do you feel these entertainment industries have a duty to improve the way they portray archaeology and would it make a difference? Are people just naturally more attracted to the action-packed adventures of Indiana Jones and Lara Croft? JJ – For the most part, I have no problem with individual movies or games that sensationalize certain aspects of archaeology. This makes me less like Samantha Sutton and more like her uncle Jay in that I tend to give even the most egregious fictional representations of the science a pass. What Tomb Raider and Indiana Jones both do well, and why I think they’re both successful, is that they tap into the very real and very unique excitement of encountering physical remnants of the past. Yeah, Lara would be a horrendous archaeologist–though of course she’s not an archaeologist at all. Indy’s skills are a little harder to gauge, since I think anyone facing off against the entire Third Reich should get the benefit of the doubt. But both series are escapism and entertainment, and I trust that most people–kids included–are not so impressionable as to think that these stories or characters mirror the real world in any substantive way. That said, I do think that the totality of how archaeology is presented in pop culture is problematic. Worst of all are the schlocky TV shows purporting to be truthful, which are really anything but. For example, I have no patience for the “Archaeo-alien-ology” shows, which, for the most part, feed off the racist idea that non-Western peoples had to have some kind of help to produce amazing things. There needs to be something to balance out the sensationalism. I hope that my series demonstrates to young readers that archaeology is exciting and interesting in its actual practice. KM – Last but not least, do you have plans for a fourth novel? It’s a big world with countless archaeological sites to explore so there’s no shortage of places for Miss Sutton to visit. I’d like to thank Jordan Jacobs for taking time out of his busy schedule to answer my questions and for his spectacular work on the Samantha Sutton series. His upcoming novel Samantha Sutton & the Temple of Traitors is now available for preorder on Amazon and Amazon UK. Would you like to know more about the Samantha Sutton series? Then check out my review of the first two books, Labyrinth of Lies and Winter of the Warrior Queen or visit the author’s website. Great interview and valuable thoughts on benefit and curse of media portrayal of the archaeologist’s profession. It certainly is somekined of love-hate relationship and I completely agree to better make use of it to attract more interest than simply condemn. Despite the alien twist (heck, even Indy wasn’t immune to this) – as annoying as racist, good point there, too.